ACTIVE ROUTE MARKER: Fortune cookies and something involving boat? "Tonight, the race continues as the ten remaining teams seek good fortunes in Hong Kong. The teams are presented with the race's only fast forward [sic]. Will any of them be brave enough to attempt the hair-raising challenge?" Yep, that's right, head-shaving. And guess what? Seven's advertising has been spoilerriffic enough to tell us who takes it -- in the commercial with all the "fly to..." clips, Joey's bald. The boat trip would be between Hong Kong and Macau, right? And you can add Muscles/Bambi and Mo/Mos to the Safe list -- the ads and precaps show them completing TAR Israel's Wine/Shoot Detour in South Africa respectively, and Muscles/Bambi are also seen at the crossbow task in Prague. So I would assume that Richard and Joey use the Fast Forward, which is head-shaving again? It may have appeared in this weeks Previously on. There was a lot of stuff there. It may have been there too, but it's noticeable in one of the commercials, too -- in the bit where they're all reading "fly to South Africa", you can tell there's no hair underneath her bandana (which itself is being worn differently than in her usual headband style). I am not entirely sure we can say there is no hair in that shot. He in particular still seems to have hair. There was nothing in the preview about a FF and there was no shot of Joey bold. I'm not saying that it will not happen, just that we have no proof so far. I guess this goes here too. 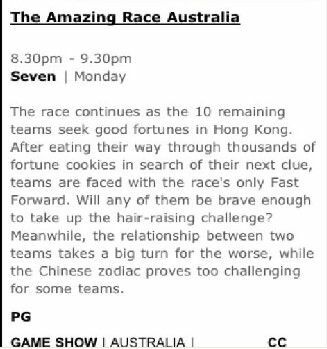 BayBay sent me this, I think it is our TV Guide blurb?? - The boat shots belong here, not with the Macau ferry. And why does everyone link Hong Kong to fortune cookies when I haven't seen one here, ever, in my two decades living here? Task is a repeat of TAR:A 3, but in a cooler location. Teams depart from the same harbour as in TAR 17. - Repeat task of TAR:I. Shot of Matt/Tom are of them running into the entrance of the park. - Repeat task of TAR:A 3. Presumably gate opens to the Pit Stop within. Or would it be on St Paul's ruins? Not shown yet. Sam/Renae, Mo/Mos, Tracy/Anne Marie, Jeff/Luke, Tyler/Nathan, Matt/Tom, Dave/Kelly, Alana/Mel are all doing tasks in Macau. Richard/Joey and Anastasia/Chris not shown in Macau thus far. In the beginning of episode 2 they show us scenes from next episodes. As far as I can tell the only team we don't see is Jeff/Luke. We do see Ann-Marie and Tracie in a car. I don't think we have seen this scene so far in the first tow episodes. ^ They are wearing the same clothes as they do in scenes from the Chinese Zodiac, so I guess it's from Hong Kong. But still only them and Jeff and Luke not shown, so it has to be one of those two teams to be eliminated. Honestly that pic we have does definitely indicate Richard and Joey doing the FF. Joey has long, thick hair, and under that bandana nothing much is going on, also Joey is wearing the bandana in South Africa (similar to Joyce) and Richard never had much hair at all anyway guys...go and see for yourselves. There's also a second shot of Richard in the intro precap (right near the beginning, just after the jetski tipping over -- Israel? Perth? Singapore?) in which he definitely looks bald.